By popular request, we have a supplier of RV Forum logo wear. 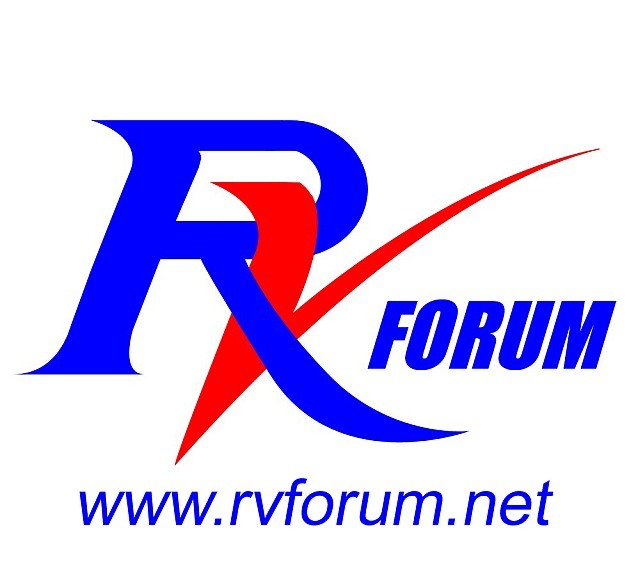 Embroidered collared polo shirts are embroidered with the RV Forum logo (see logo images below). These shirts are available in a variety of colors, priced at $20.00 + tax (California residents) + $5.50 (estimated) shipping. Larger sizes: add $1 for XXL, or $2 for XXXL. Shirt color options can be viewed here: Men's shirts or Ladies shirts. The shirts can not be ordered online at this time, but can be ordered directly from our supplier via phone or email (see Contact info below). To minimize the cost to our members, The RV Forum does not make any money from these offerings; We paid for the logo design a few years ago, but have no desire to get into the garment or shipping business. That's why you deal directly with the supplier. Logo caps, available in a variety of colors, can also be ordered, priced at $18.00 + tax (California residents) + shipping. Other clothing choices are available for viewing at the supplier's catalog, here. Our logo, used on embroidered clothing. Note that, where the colors of the logo conflict with the shirt color, an alternate white/grey or grey/whte logo will be used. A big thanks to Kip of Sandy Beach Traders LLC for help in cleaning up the colored digital image. The 16" x 24" flag has our 2-color logo silkscreened (digitally dyed) on a white nylon background, with canvas header and grommets. Priced at $20.00 each, including postage, flags can be ordered by clicking the Buy Now button below. Please note: Due to additional mailing costs, members in Canada should contact Don Miller to obtain the correct price.